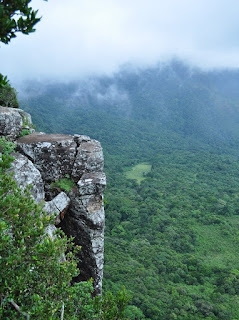 ‘World’s End’ in Sri Lanka usually means a high precipice. The one at Horton Plains is the more famous one. In addition there are many mini world’s ends in most parts of the Central Highlands. Usually these places get misty very easily and sometimes you may not see anything other than the white clouds over the edge. To me the real feeling of world’s end is when it is full of mist. But many people like to see it on a clear day. So you can see the spectacular scenery below and over. This picture was taken at the mini world’s end of Pitawalapathana. You can get to that rocky ledge and witness an incredible view of Knuckles Range and beyond. Yes,below you see endless forest belongs to Knuckles Range. Yes, we must be very careful, otherwise it is then the end of the world. What a beautiful and peaceful place. If that precipice was here there would be people climbing all over it. The mist framing the top is captivating. The field in the center, below really accentuates the trees surrounding it - and enables us to see just how high that precipice is! Good point. I think for some reason we do not find rock climbing or abseiling in Sri Lanka that much, although there are plenty of places to do so. May be due to the element of risk involved with those sports. Yes, this precipice is easily over 1000 feet. I too loved the field in the middle and the dense forest around it. But you can get to the ledge fairly easily and safely and take some stunning pictures. I can understand why this is considered a "World's End". Standing there on a misty day must be an incredible experience, but I'm glad you've shown some of the forest and and the mountain in the background. Wow---I'd love to sit on that rocky ledge and just enjoy the beauty all around me... What a fabulous picture. We saw some fog/mist in the mountains here just like that. Places like these will drive rock climbers insane. I have witnessed some climbing the face of El Capitan The last record was 2 hour 36 minutes and 45 seconds to climb a vertical like your photo, which is 2900 foot drop. El Cap is 7569 feet tall from sea level. This is the same place that we heard the sad news few days ago? As usual, a beautiful photo. I've been to this place! Wow.. that's a breathtaking + spine chilling sight! World's ends are truly nature's marvels. such beauty, thank you for sharing this with us. 2900 feet in 2 hour 36 minutes is insane! You need to be insanely fit and possess lot of stamina as well as be a very brave person! Sorry, I’m not aware about the news. What is it?? incredible picture. i'd be climbing out to the edge so i could sit down & take it all in. beautiful. hope all is well. I'm fine and thanks very much for your comments! That's quite an amazing view you're showing us there! It almost looks like some sort of ancient rock carving. Beautiful! Extraordinary! The surface and view are amazing. Mist floating over the lush landscape adds to the spectacular scene. I should love to stand there! One's imagination can fly away from such a place.